Three short videos which follow three associates through their 12 week programmes - Anthony, Sholape and Chris. Yesterday, I interviewed Growing Talent employers and also individuals associated with the program. 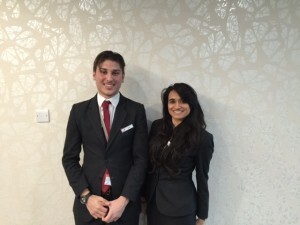 Firstly I travelled to More London to interview Michelle and Michal from Portico. Michelle ex Forensic Policewoman and Michal who has visited every continent in the whole world! Apart from these amazing stories they also told me the ins and outs of their involvement in Growing Talent. They work as a team to provide individuals with an opportunity so that they can get into the working world and give them a chance to succeed in their ideal career. One of Michelle and Michal’s past Growing Talent graduates, Rehana is now a fully trained Team Leader! They understand everyone goes through hard times and say “Yes, you do go through hard times but you will get through it” this is a great confidence boost for their Growing Talents, these guys should keep up the good work! My final interview of that day was with Chris from Portico. She has a passion for Art. She uses her passion to show the Growing Talent Associates some creativity they can use during their lunchtimes/breaks/at home which is cheap and relaxing. In the workshop Chris teaches basic sketching, shading, and drawing. From the basics of how to hold a pencil to get the best ‘flow’ to the skills of blind drawing. This always draws laughter in the room when Growing Talent Associates draw each other without looking at their paper! Prior to Chris’s workshop, the Growing Talent Associates undertake an off-site project. Together they visit an art gallery, select a painting that stands out to them – either because the love it or hate it. They note down various things about the painting and one question they would ask the artist. What they don’t know is they are asked to recreate their painting as a ‘taster’ before Chris arrives. She loves to see the Growing Talent Associates come out of their shell and show their creative side. Chris has often delivered this workshop during her annual holidays. When she wants to spend time away from work to switch off she goes to the cinema with her friends and also enjoys crosswords, as well as continue with her own art classes. This also brings out not just her creative side but also her social side! 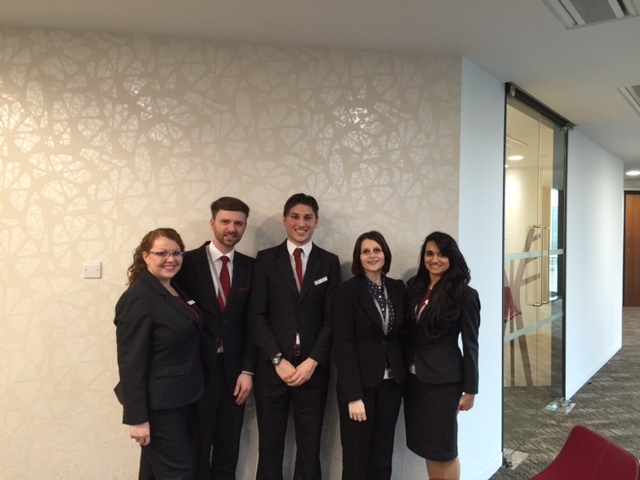 An audience with….. some amazing Growing Talent Associates! 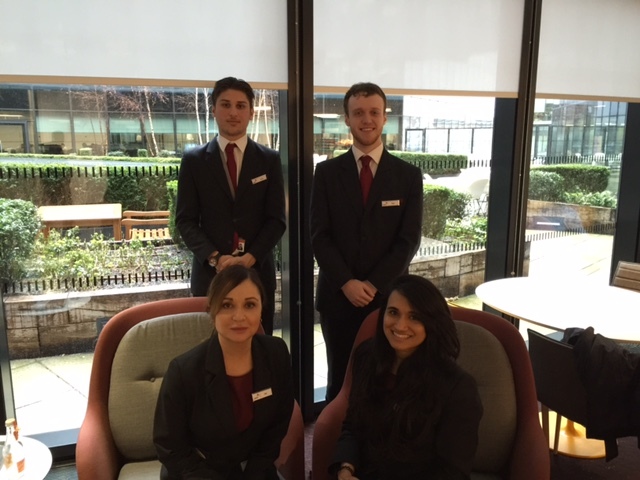 This is the fourth week of Growing Talent and the third week in their operational role for the Growing Talent Associates. Word was that all was well. Was the word reality? Only one way to find out! A whistle stop tour of the sites to meet the Associates and their managers. 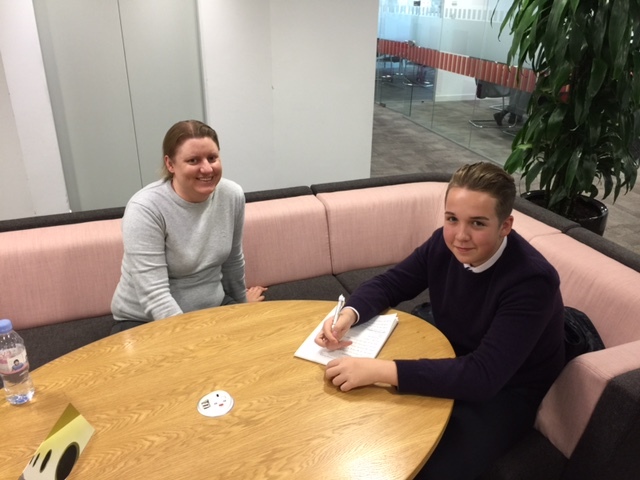 First stop was to see Julie based with Portico’s team at Fenchurch Street. A large corporate building with public access. A hectic site in the heart of London. Looking every inch the professional in her Navy & Claret uniform, Julie’s smile beamed out from the reception desk as I arrived. Supported by the team on site, Julie is learning the operations and processes for this multi-tenanted building. ‘I’m still smiling’ said Julie even though the days are exhausting, she’s strangely energised! My next visit was to see Sadeeq who is working with MitieTDM’s team at PwC More London. It was great to see Sadeeq stroll across the atrium as though he’d worked there years instead of weeks! So, how is he really getting on? 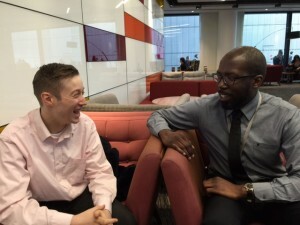 ‘Great’ – Phil is Sadeeq’s manager and explained it’s not always easy to learn the job, get used to the shift system and fit in with the clients and team – but Sadeeq has managed it well. Sadeeq is enjoying being back at work and helping people. He still maintains his coaching and support activities for vulnerable people outside work. Coupled with seeing his family and friends – Sadeeq is busier than ever and doing very well! Next stop was Portico’s team at More London to see Jamie, Dan & Krupita. 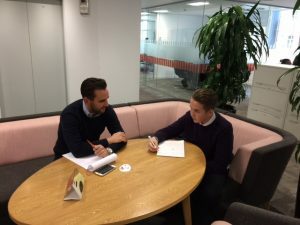 Dan had to travel across from Embankment Place where he is usually based and joined us later with Jac his training mentor – herself a Growing Talent Graduate! Jamie showed me his own instruction manual he’s made to help him remember everything – highlights and tabs – very impressive with inspirational messages on the cover. He’s ‘loving it’! Bruno is his training mentor and encourages Jamie well. 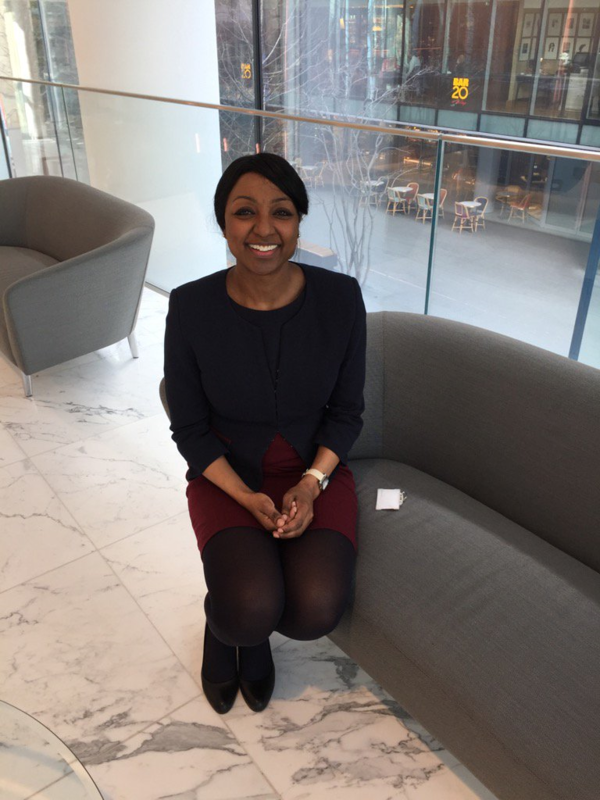 Krupita has only been with her team a few days following a move from a sister team at Embankment Palace where she met the infamous Jordan – Graduate from Growing Talent 2. We were then joined by Michelle one of the Portico Managers who had been through all the selection processes with the guys. She explained all was going well. Poor Michal and Ewelina came over to collect Michelle for a meeting and got sucked into a photo! Good job Portico team members are all good sports and so supportive of Growing Talent! A very wet Jac and Dan then arrived. Mini catch-up for Dan, Jamie & Krupita. Jac said Dan was doing really well and she was still enjoying her role too – especially being a mentor to Jamie. The circle keeps turning! A final photo before we all went back to work! Luckily De Vere’s team were able to move us to a larger room for yesterday’s Social Enterprise Judging Panel. The room was huge enabling the Growing Talent Associates to spread out and rehearse comfortably. With just an hour to go before the judges arrived at 10am, the Growing Talent Associates spent the time ‘getting in the zone’. For some, this meant some quiet contemplation. For others it was rehearse, rehearse, rehearse! 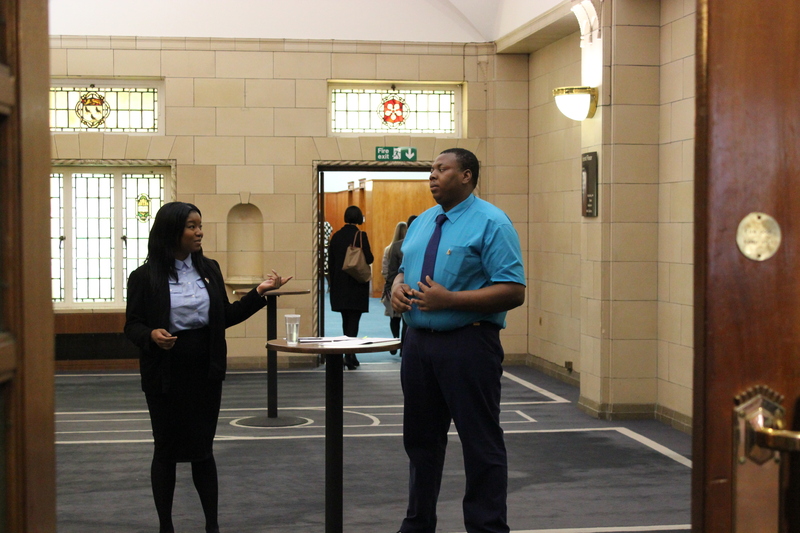 Alenchenu and Shennell hit the lobby to rehearse their Bridge to Society idea. 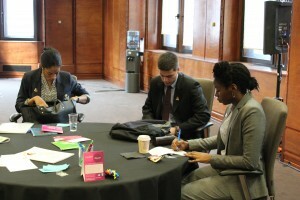 Shanika, Jose & Camilla calmly rewrote some notes for their individual presentation. The judges were Jo from JobCentre Plus, Jordan from Portico, Patti Pertemps in Basildon, Jon of PwC, Gillian of MHFA, Simon from Portico & Chloe from Iron Mountain. 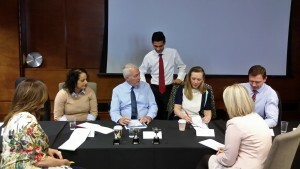 After seeing the presentations, the judges gave some individual feedback before deliberating a winner. The ideas were so good, the deliberations went on and on………. 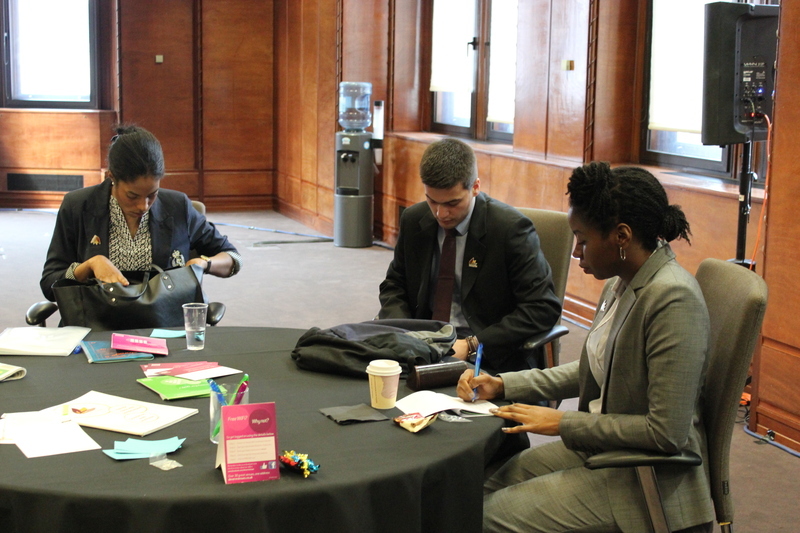 Jordan was able to give an insight into how stressful it is to devise and deliver a Social Enterprise idea. He was in that position a year ago! 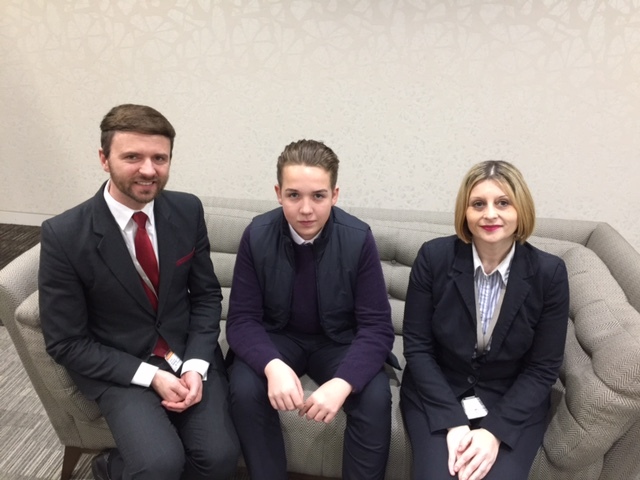 Below – three generations of Portico! 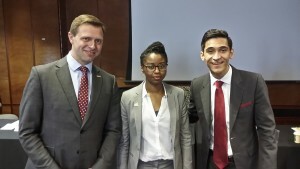 – Simon, MD, Camilla current Growing Talent Associate and the brilliant -Jordan – Welcome Host & Growing Talent Associate! The overall winner was – Camilla for her idea – Renaissance House. Jose’s Design 4 You a commercial project to design and make clothes for people with learning disabilities who would be trained using the Government’s apprenticeship programme before being employed in all areas of the business. Shennell & Alenchenu were next with their Bridge to Society which focussed on pre-release support for young offenders with support in all areas as well as links to a local gym on release. 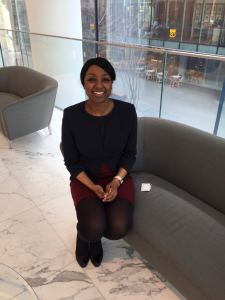 Shanika was third in the running order with The Nest her project incorporating a bookshop and swap shop facility for the old and young to learn from each other. BRR – no it wasn’t cold! This is the group name for Bradley Reece -N and Reece W whose idea was to have a creative hub where all acts would be trained to put on a twice yearly show. Jason & Alex delivered their idea – Learn & Grow to an enthralled panel of judges. Oasis was an idea on homelessness delivered by Gavin. 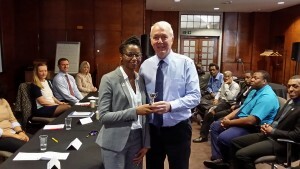 Above, Camilla receives her cup from Jon for her winning idea – Renaissance House. The guys left for a relaxing weekend ahead before commencing their operational section learning every aspect of the role they will secure on completion of Growing Talent. 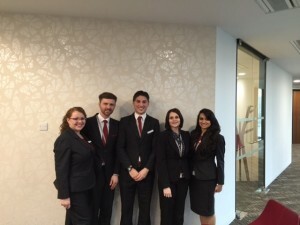 We wish them well but not good luck – they’re Growing Talent Associates and don’t need luck! 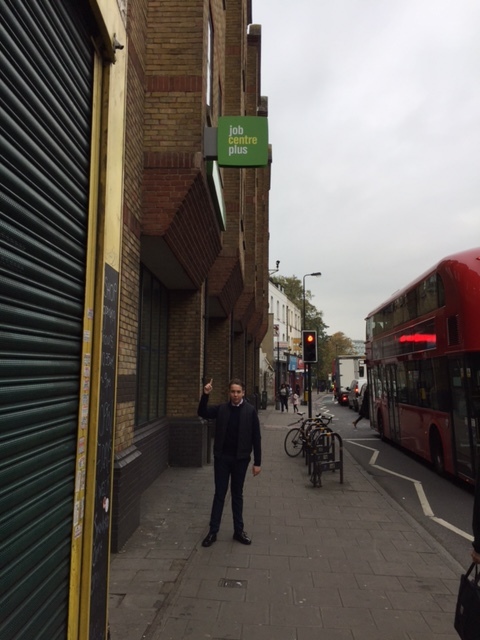 Harrow Green has commenced Growing Talent with an intense training programme for their drivers/fitters/porters. Michael, Daoud, Kaith, Joshua & Selwyn have embraced the challenge of a new environment and totally new industry. Sharon decided they deserved a day off today. Not to relax, chill or watch repeats on daytime tv, oh no – all have to write a blog on their experience so far. I think it might have been easier to be in work! ‘Oops, sorry I was in the shower when you called! I’m really enjoying it the training is fantastic and the people at Harrow Green are so welcoming. It really helps having the other lads around me. Thanks for everything’ Joshua – who I hope wasn’t dripping wet from the shower! ‘Thanks’ – Daoud – a man of few words – unless talking about football! After the bonding, growth in self-esteem, confidence and communication, it’s great to know the guys are doing well on site. No doubt their own blogs will follow!